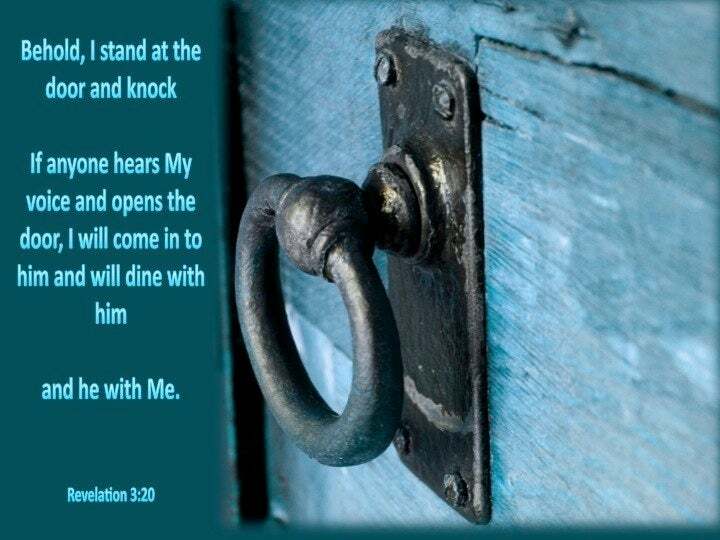 ﻿ Revelation 3:20 Behold, I stand at the door, and knock: if any man hears my voice, and opens the door, I will come in to him, and will eat with him, and he with me. Behold, I stand at the door, and knock: if any man hears my voice, and opens the door, I will come in to him, and will eat with him, and he with me. Behold, I stand at the door and knock. If any man hears my voice and opens the door, I will come in to him, and will dine with him, and he with me. 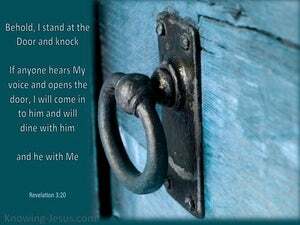 Look, I am standing at [your] door and knocking; if anyone hears my voice [i.e., the sound of my knocking], and opens the door, I will [surely] come in to him and eat with him and he [will eat] with me. Behold, I stand at the door and knock; if any one hear my voice, and open the door, I will come in to him, and will sup with him, and he with me. See, I am waiting at the door and giving the sign; if my voice comes to any man's ears and he makes the door open, I will come in to him, and will take food with him and he with me. Behold, I stand at the door and knock. If any one hears my voice and opens the door, I will come in to him and eat with him, and he with me. behold, I stand at the door, and knock: if any man hear my voice, and open the door, I will come in to him, I will sup with him, and he shall afterwards be entertain'd by me. Behold, I stand at the door and knock: if any one hear my voice, and open the door, I will enter into his house, and will sup with him, and he with me. Behold, I stand at the door, and am knocking: if any one may hear my voice, and may open the door, I will come in unto him, and will sup with him, and he with me. Here I stand knocking at the door. If anyone listens to my voice and opens the door, I will be his guest and dine with him, and he with me. Behold, I stand at the door and knock: if any man hear my voice and open the door, I will come in to him, and sup with him, and he with me. Behold, I stand at the door and call; if anyone hears my voice and opens the door, I will come into him and will sup with him, and he with me. 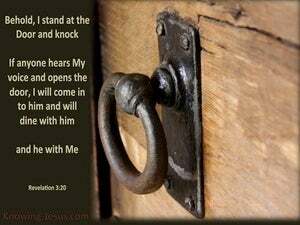 Behold, I stand before the door, and knock: and if any hear my voice, and open the door, I will come in to him, and will sup with him, and he with me. Behold, I stand at the door and knock! If anyone hears my voice and opens the door, indeed I will come in to him and dine with him, and he with me. Behold, I stand at the door and knock. If any man hear my voice and open the door, I will come in unto him and will sup with him, and he with me. Lo, I stand at the door and knock; if anyone hears my voice and opens the door, I will come in and sup with him, and he with me. 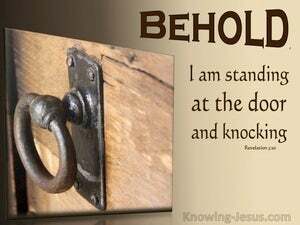 Behold, I am standing at the door and knocking! If any one listens to my voice, and opens the door, I will come to him, and sup with him, and he with me. Listen! I am standing at the door and knocking! If anyone hears my voice and opens the door I will come into his home and share a meal with him, and he with me. Behold, I stand at the door and knock. If anyone hears my voice and opens the door, then I will come in to him, and will dine with him, and he with me. Behold, I stand at the door, and knock; if any one hear my voice, and open the door, I will come in to him, and will sup with him, and he with me. Behold, I stand at the door and knock; if any one shall hear my voice and open the door, I will enter in to him, and feast with him, and he with me. Lo! I am standing at the door, and knocking; if anyone shall hearken unto my voice, and open the door, I will come in unto him, and will sup with him, and, he, with, me. Lo! I stand at the door, and knock: if any person hear my voice, and open the door, I will come in to him, and I will sup with him, and he with me. I am standing at the door and knocking! If any one hears my voice and opens the door, I will go in, and will feast with him, and he shall feast with me. Behold, I stand at the door, and knock: If any man shall hear my voice, and open the door, I will come in to him, and will sup with him, and he with me. I am now standing at the door and am knocking. If any one listens to My voice and opens the door, I will go in to be with him and will feast with him, and he shall feast with Me. I am now standing at the door and knocking. If anyone listens to my voice and opens the door, I will be his guest and feast with him, and he with me. "Behold, I stand at the door, and knock; if anyone hear my voice, and open the door, I will come in to him, and will sup with him, and he with Me. Behold, I stand at the door and knock: if any one hear my voice, and open the door, I will come in to him, and will sup with him, and he with me. 19 As many as I love, I rebuke and chasten: be zealous therefore, and repent. 20 Behold, I stand at the door, and knock: if any man hears my voice, and opens the door, I will come in to him, and will eat with him, and he with me. 21 To him that overcomes will I grant to sit with me in my throne, even as I also overcame, and sat down with my Father in his throne. And you yourselves be like unto men that wait for their lord, when he will return from the wedding; that when he comes and knocks, they may open unto him immediately. And will not rather say unto him, Make ready that I may eat, and gird yourself, and serve me, till I have eaten and drunken; and afterward you shall eat and drink? And he said unto me, Write, Blessed are they who are called unto the marriage supper of the Lamb. And he said unto me, These are the true sayings of God. I sleep, but my heart wakes: it is the voice of my beloved that knocks, saying, Open to me, my sister, my love, my dove, my perfect one: for my head is filled with dew, and my locks with the drops of the night.